Raw Daily Vitality, formulated with whole food nutrients, can bridge the gap between what we eat and what our body needs. Our exclusive formula fortifies the body by including the correct ratios of organic and wild-crafted raw food nutrients and a wide array of vegetables, fruits, berries, and seeds. Eating a diet rich in whole foods is the best way to get the vitamins, minerals, and nutrients your body needs to maintain health. However, busy lifestyles, eroded soil, over-processed foods, and the standard American diet can leave us lacking many important nutrients. We invite you to experience the natural, wild harvested, and organic difference. A feeling that only comes from taking some of the purest, most bioavailable nutrients available anywhere. When you feed your cells with exactly what they need... real nutrients from food, not synthetic chemicals... your body will hum with vitality and energy. Our formula includes a powerful antioxidant blend of Echinacea, Green Tea Extract, Pine Bark Extract, Grape Seed Extract, Bilberry Extract, Ginseng Powder, Glutathione, and Lycopene. 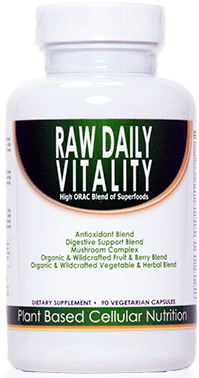 Raw Daily Vitality is made to exacting standards to benefit everyone who takes it. For example, the Wheat Grass and Barley Grass in it are gluten-free. They are harvested at the peak of nutrition, prior to jointing and before any gluten is formed in the plant. Our synergistic whole-food formula is unlike anything you've ever tried before, and it reflects our unwavering, 100% commitment to authenticity, effectiveness, value, and your health and wellness. As a dietary supplement, recommended serving size is one capsule three times per day with meals. * If you are pregnant, nursing, or under a doctor's care, consult your healthcare provider prior to use.